Once you get your business started, decide on your niche, and identify some products to sell it’s time to build your marketing funnel. 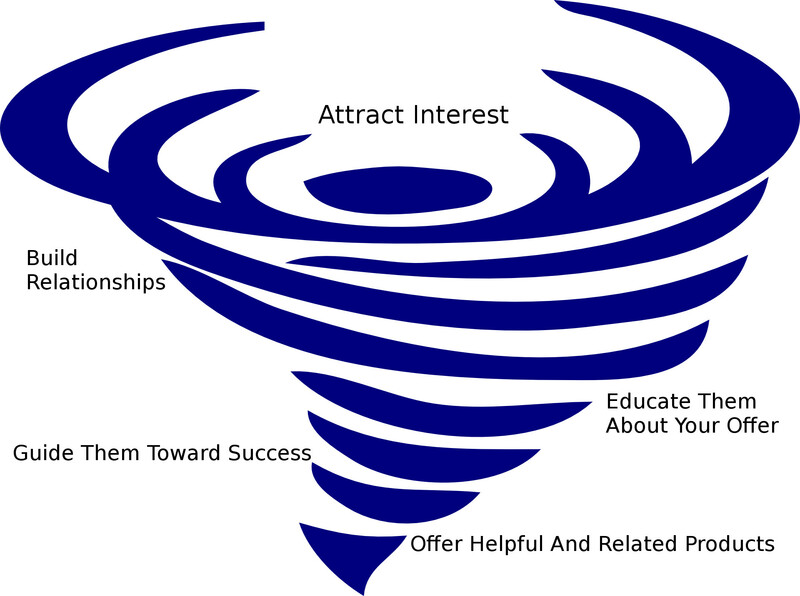 Because the funnel eases your business’ path to success. What Do You Mean – Your Marketing Funnel? Before we talk about what you put into a business funnel and how you build it let me explain exactly what your marketing funnel actually is. When people see your advertisement or other marketing message (more about that in a moment) and want more information about your offer they’ll visit your website to see what it’s all about. Some of those people will have enough interest in your product to get closer to it – perhaps even end up buying from you. Most of those people will not become further interested. That’s why you set up your marketing funnel. All of these people enter into the wide opening at the top as mildly interested prospects for your offer and they start their journey through your marketing campaign. The majority will disqualify themselves during the process in one way or another and drop out of your funnel. As the numbers of qualified prospects diminish the funnel narrows to more focus their progress. Your marketing funnel focuses on building your subscriber list while potentially making a sale. You want to build your funnel so that it does capture your prospect’s contact information (building your subscriber list) and doesn’t give it away to someone else (which happens if you send the prospect straight to an affiliate offer without first getting him to sign up for your mailing list). When the prospect becomes your subscriber you can continue to send him educational information and also market to him in the future. This is one major reason to build your own marketing funnel. Don’t just rely on a funnel that somebody else creates for your use. Now that you know the basic definition of the marketing funnel let’s talk about the different parts of the funnel as they relate to this discussion. This is where your prospects enter your funnel. You attract their interest to your website through various traffic generation techniques. Those include classified ads, social media marketing, blog and forum posting & commenting, magazine ads, etc. The prospect reads your marketing message and if your copy is effective his interest is peaked enough to visit your product’s web page (the top of your funnel). If your prospect does not believe in you or that you’re a real person he’ll drop out of your funnel faster than an enraged grizzly coming at you out of the bushes. You must establish a trusting relationship with your prospects or not only will they NOT sign up to your list as subscribers – and you must get them to give you their contact information fast – there’s no way they will continue through your marketing process toward the product buying conclusion that you want. 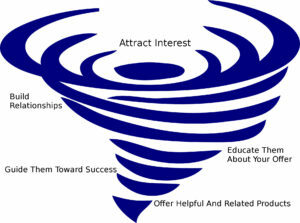 Once the relationship is in place you build on the level of interest that you’ve already kindled in your prospect. You do that by educating him on your offer. You send a series of informational messages – each message telling him a little bit more about why the product you’re offering will improve his life in some way – heal a hurt, solve a problem, make him money, make him look like a hero. The goal is to help him understand that your product is a must have item for him. Your responsibility toward your prospect does not end when he buys from you. Now he’s your customer and you owe him your help to get him moving toward the successful path he seeks. Here you show your customer how to properly put your product to use. Be ready to answer questions and provide tips. Be the caring mentor that your customer needs. This continues to build your relationship and promotes loyalty to you on the part of the customer. Over time you use many different tools to perform the activities of building your business. In this level of your marketing funnel, you’ll start offering those tools to your customer that relate to and complement the other products he bought from you. When your relationship is solid your customer trusts you and comes to rely on you to offer him a continuing lineup of tools (products) to improve his path to success in whatever endeavor he pursues. When you design each level of the funnel properly each succeeding level builds on the one before. By attracting interest, creating relationships and building on those relationships, and educating your prospects about the value of your products, you instill trust and loyalty on the part of those who become your customers. Because of that trust and loyalty, your customers, in turn, will tell other people about your products. That’s called word of mouth advertising – and it’s the most profitable advertising that you can enjoy. Plan your marketing funnel with care, with targeted focus on these levels, and you’ll enjoy a successful business and the comfortable life you desire.